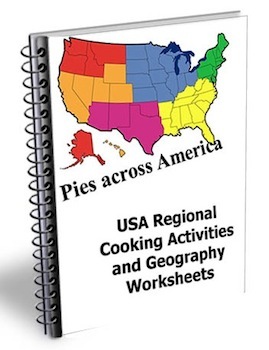 Southern Cooking covers recipes found in the Southern United States. 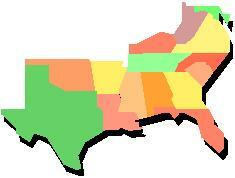 Southern Cooking in the United States covers many types of food such as soul food, Creole cooking/Cajun and barbecue. In Florida you will hear of the popular key lime pie whereas Texas is known for great steaks and chili. Collard greens, turnips and okra are popular vegetables eaten in the Southern USA. Boiled peanuts are a favorite snack. Another name for these are goober peas. Biscuits with a milk gravy is a favorite breakfast food in the South. Combine buttermilk, ¼ teaspoon pepper, and salt. Add chicken pieces and refrigerate overnight. Combine flour, seasoned salt and ¾ teaspoon pepper in baking dish. Heat shortening and butter in pan until it reaches 365 degrees on a thermometer. 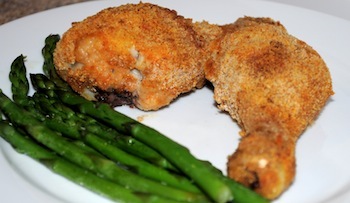 Take chicken out of buttermilk and coat in flour mixture. Fry until golden brown and cooked through. A common Southern cooking recipe in the southern USA is grits. In a saucepan boil 2 cups water then stir in grits. Turn heat down and cover with a lid. Cook about 5 minutes. Stirring occasionally. After 5 minutes add butter and cheese. Separate egg yolk from egg white. Set aside egg white for later. In a small glass beat egg yolk with milk. Add into grits mixture. Stir to combine. In a mixing bowl whip egg white until stiff peaks form. Stir into grits. Pour grits into a greased casserole dish. Bake at 350 degrees for 1 hour. You can also add cooked crumbled sausage to the grits before baking. 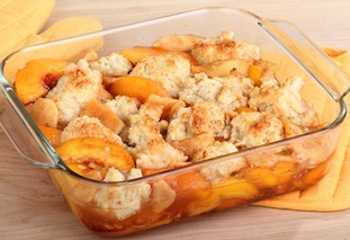 Peaches grow in Georgia making peach cobbler a common southern cooking recipe. In a mixing bowl blend together flour, 1 tablespoon sugar, baking powder and salt. Mix until flour mixture resembles fine crumbs. Stir in ½ teaspoon milk and set aside. In saucepan mix ½ cup sugar, cornstarch, cinnamon and nutmeg together. Add peaches and lemon juice. Cook over medium heat and constantly stir until mixture thickens and comes to a boil. Allow to boil about 1-2 minutes. 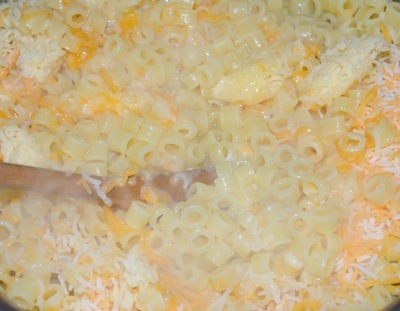 pour into a small casserole dish. Spread flour mixture over the top of peaches. Bake at 400 degrees for 25 minutes or until golden brown. 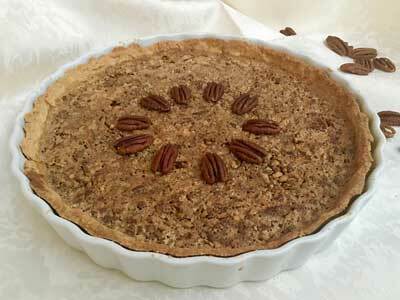 This southern cooking recipe uses pecans that grow in Texas. Prepare pie crust for bottom of pie. Set aside and preheat the oven to 375 degrees. In mixing bowl, blend sugar, melted butter, corn syrup, salt and eggs together. Stir in pecans. Pour into prepared pie crust. Bake for 40-45 minutes until center is set. Barbecue beef or pork is famous in Southern Cooking and contests are often held to see who has the best barbecue recipe. Place meat, onions and water in crock pot and cook 6-8 hours. Drain and set broth aside for later. Shred meat with a fork. Prepare barbecue sauce. Combine all sauce ingredients in a bowl. Stir shredded meat into the sauce and pour back in the crock pot for about 20 minutes. 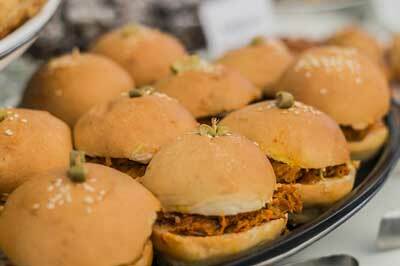 Serve shredded meat on buns or rolls. See more recipes on making roast beef. In the New Orleans, Louisiana area southern cooking can be called Cajun cooking or creole cooking. Cut sausage into slices. In large skillet, cook sausage flipping over and browning each side. Set aside and wipe out grease from pan. Add uncooked rice, chicken broth, thyme, chili powder,chopped pepper, grated carrot, quartered onion and chopped tomatoes with juice to your skillet. Stir all together and add sausage back to the pan. Cover with a lid and simmer on medium about 10-15 minutes until rice is done. If you are using brown rice keep in mind the cooking time will be different as brown rice takes much longer than white rice. **If desired, add quick cooking shrimp along with the southern cooking ingredients before simmering. You'll often see this Southern Cooking recipe called Red beans and rice. This recipe is a kid friendly version for soup. Cook and chop bacon. Cut leek, celery and bell pepper in small pieces. Combine vegetables, beans, thyme and water in large pot. Cook covered on medium-low until vegetables are soft. Season with salt and pepper and stir in cooked rice. Top each serving with bacon pieces. 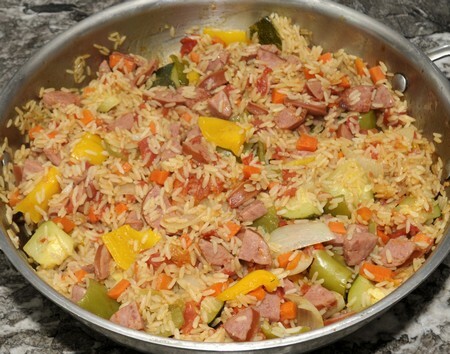 See more Cajun foods such as Shrimp po boys, King Cake and Dirty Rice on our our Mardi Gras page.